Researchers working toward the mysterious lithium-air battery have unveiled an unexpected approach to capturing and storing carbon dioxide away from the atmosphere. Using a design meant for a lithium-CO2 battery, Researchers in China and Japan have developed a way to separate solid carbon dust from gaseous carbon dioxide, with the potential to also isolate oxygen gas via the same technique. Their research appeared on August 9th in Joule, a new interdisciplinary energy journal from Cell Press. This is a flowchart of energy storage and carbon fixation using Li-CO2 technology. Credit: Qiao et al. Converting carbon dioxide emissions into other carbon-containing compounds is advantageous due to carbon dioxide's contribution to the global warming and greenhouse effect. Examples range from natural processes, such as plants turning CO2 into sugar and oxygen, to man-made ones, such as injecting carbon dioxide into rock formations to be trapped as carbonate minerals. The problem with most physical and chemical pathways for CO2 fixation is that their products are gases and liquids that need to be further liquefied or compressed, and that inevitably leads to additional energy consumption and even more CO2 emissions. Instead, we are demonstrating an electrochemical strategy for CO2 fixation that yields solid carbon products, as well as a lithium-CO2 battery that can provide the energy necessary for that process. The Scientists discovered the carbon fixation strategy while attempting to recharge a lithium-CO2 battery prototype. Rather than fully regenerating lithium ions and CO2 from the lithium carbonate and carbon produced during battery discharge, as would have occurred with a reversible Li-CO2 battery, the lithium carbonate decomposed, producing additional carbon, as well as oxygen gas that were not separated due to fast reaction with the battery electrolyte. In general, this kind of buildup results in reduced functional lifetime and physical degradation for a battery, but instead, the deposition of solid carbon offers a separate advantage, indicating a promising approach to fix carbon in a stable and easy-to-dispose-of form. What is impressive about this work is the possibility to convert one-third of the CO2 species to carbon with high theoretical energy efficiency above 70%. Battery architecture is an unforeseen but intriguing way to look at carbon fixation. Since generating carbon solids both realizes carbon fixation decreases battery performance, the Researchers were not able to meet both goals at the same time within a single device. However, by integrating a small amount of ruthenium metal into their design as a catalyst, they were able to avoid carbon deposition to a large extent and promote better reversibility, converting their carbon-fixing apparatus into a functioning Li-CO2 battery. Moving from pure CO2 to ambient air still remains as a challenge for both battery performance and carbon fixation. However, this would be a jump that would probably allow for treating atmospheric CO2 in the first case and would move forward towards the theoretically powerful but not-yet-stable lithium-air battery technology in the second case. The fixation technique might also be adapted to scrub other polluting or harmful gases such as nitrogen dioxide, nitric oxide, sulfur dioxide and carbon monoxide from the atmosphere, Zhou says. Moving forward, the Scientists are also thrilled by their system's potential to probably lead to a pathway for converting carbon dioxide into pure carbon and oxygen gas. 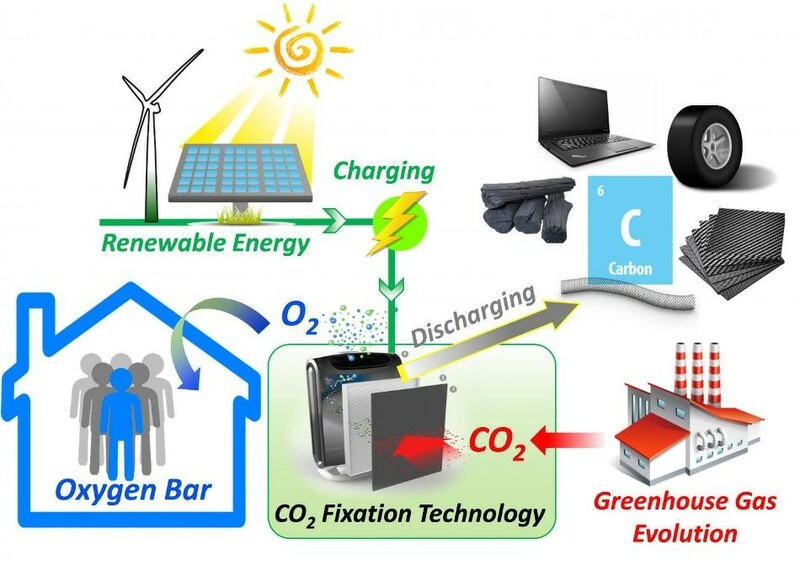 Attaining the release of oxygen gas upon charging, coupled with the accumulation of solid carbon, would realize an electrochemical carbon dioxide fixation strategy analogous to photosynthesis.